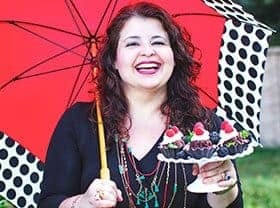 An IMPRESSIVE 16-Layer Brazilian Chocolate Cake Roll filled and frosted with chocolate ganache and garnished with berries. A modern version of the classic seventeenth century “Bolo de Rolo” from my home state of Pernambuco. 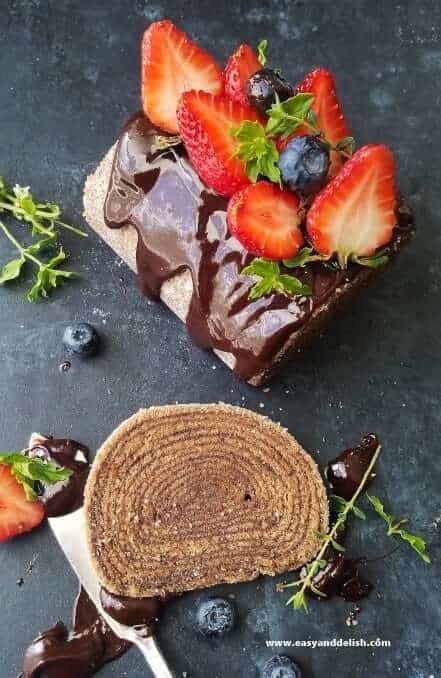 This 16-Layer Brazilian Chocolate Cake Roll, known in Brazil as “Bolo de Rolo de Chocolate,” is an unique delicacy from the northeastern Brazilian state of Pernambuco. 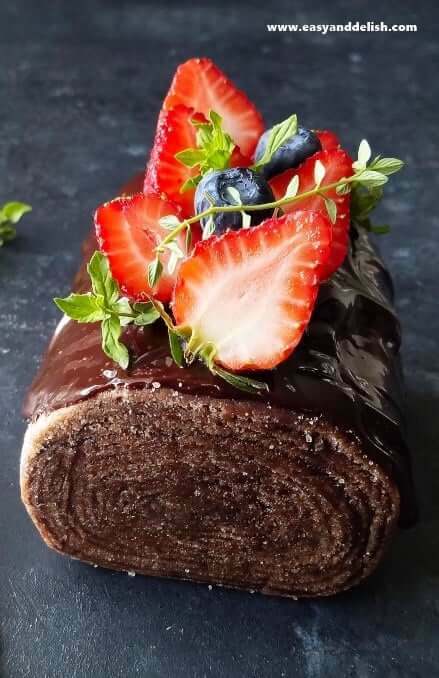 It is a jelly roll-like cake with some distinctive characteristics: its numerous and fine layers made up of thin sheets of chocolate cake… alternating with a rich chocolate ganache filling. Our Brazilian Chocolate Cake Roll is one of the modern variations on the classic centuries-old “Bolo de Rolo“ (a white cake roll filled with melted guava paste and sprinkled on top with a dusting of granulated sugar). In fact, “bolo de rolo” is so important to the culture and gastronomy of Brazil that in 2008 Pernambuco passed a law to officially designate it as a cultural legacy of the state… a frequent highlight on the menus of most cafés, bakeries, some restaurants, and even food venues at the airport. Our version is prepared with the same ingredients used for the classic, except for the addition of cocoa powder to the cake batter… as well as a rich chocolate ganache that replaces the traditional melted guava paste for the filling. The cake is so popular that has been imported by special order to many different countries around the world such as Portugal, England, France, Saudi Arabia, and Japan. In Brazil, one can encounter “bolo de rolo” with various different fillings (chocolate, dulce de leche, sweet prune paste, coconut, passion fruit, and so on). But the only two things that never change are: the thinness and the large number of its many layers. Eager to learn how to make it? Well, here goes! Prepare the cake batter: In the bowl of a mixer fitted with the paddle attachment, beat butter at medium speed for about 2 minutes. At a slow speed, gradually add the sugar, then beat for 3 to 5 minutes or until mixture is homogeneous and creamy. Add the yolks one by one, beating at low speed after each addition until just incorporated. 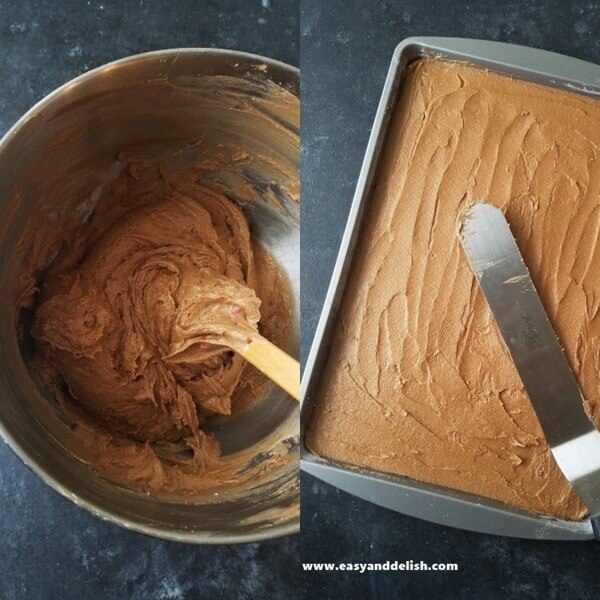 Then, at low speed, gradually add flour and cocoa powder until you have a homogeneous cake batter, scraping down the batter from the sides of the bowl a few times. Beat the egg whites until stiff. Using a spatula, gently fold in the egg whites (do not beat). Grease and flour 8 (10 x 15-inch) jelly roll pans and pour about 1 cup of batter into each. Spread the batter into a very thin and uniform layer covering the bottom of each sheet pan using an offset icing spatula. Bake the first layer of cake for 3 1/2 to 4 minutes (but do not let the cake brown) and reserve the others. MEANWHILE, prepare the cake filling. Heat heavy cream in the microwave to just before the boiling point. Pour into a bowl with chocolate chips and stir well until chocolate has completely melted and is smooth. Reserve close to a warm place so that the chocolate ganache won’t harden. Remove cake from the oven and place baking sheet on a counter lined with a clean kitchen linen or towel. Since this cake is thin and delicate, here is a great technique to release it from the pan without breaking the layer: Gently run a butter knife around the edges to loosen the cake from pan, making it easier to unmold. Next, spread a kitchen towel on top or parchment paper. Then place an empty and larger baking sheet pan on top of this, right side up, to sandwich the cake and towel between the two pans. Finally, flip the whole assemblage over in order to release the cake from the pan in which it was baked. Remove what is now the top baking sheet pan, and then gently slide the bottom pan from beneath the cake and towel. 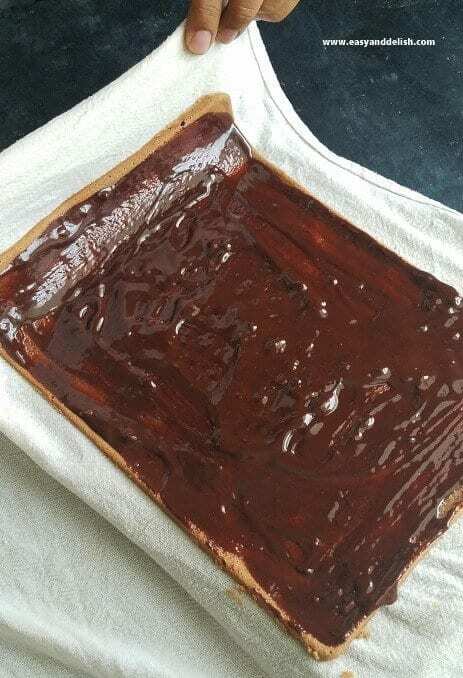 Working quickly, spread a thin layer of chocolate ganache on top of the cake and then roll: Starting from one end, pull up the two adjacent corners along the short length of the towel to initiate rolling of the edge of the cake. Continue supporting/pushing the rolling edge of the cake with the towel beneath as needed until the cake layer is completely rolled. The cake rolls more easily while still warm. Reserve rolled cake layer covered with towel so that it won’t dry. Bake the next cake and then so on. Each rolled cake is then rolled into the next subsequent sheet of cake that has been spread with the chocolate ganache. If any breaks appear in cake, press break with fingers to seal while it is still warm. Slice the 2 edges of the cake to remove rough, imperfect ends. If desired, either use the remaining chocolate ganache as a topping or sprinkle cake with granulated sugar. 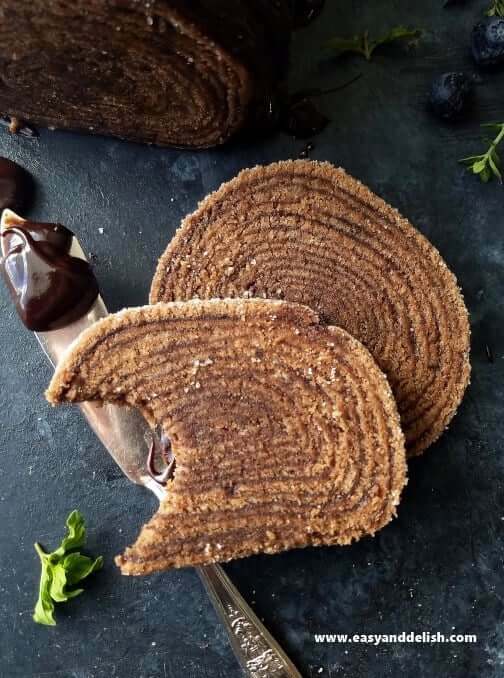 Serve Brazilian chocolate cake roll sliced into thin slices by itself, along with a cup of coffee, or slightly warmed and accompanied by a scoop of vanilla or coconut ice cream. IMPRESSIVE 16-Layer Brazilian Chocolate Cake Roll filled with chocolate ganache and garnished with berries. The modern version of the classic seventeenth century "Bolo de Rolo"! For the cake batter: In the bowl of a mixer fitted with the paddle attachment, beat butter at medium speed for about 2 minutes. At a slow speed, gradually add the sugar, then beat for 3 to 5 minutes, or until mixture is homogeneous and creamy. Beat the egg whites until stiff in a separate bowl. 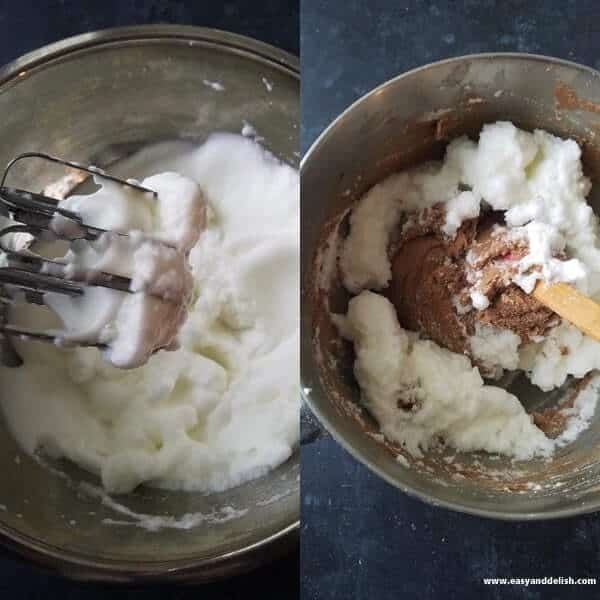 Using a spatula, gently fold in the egg whites (do not beat). Grease and flour 8 (10 x 15-inch) jelly roll pans and pour about 1 cup of batter into each. Spread the batter into a very thin and uniform layer covering the bottom of each sheet pan using an offset icing spatula. Bake the first layer of cake for 3 1/2 to 4 1/2 minutes (but do not let the cake brown) and reserve the others. MEANWHILE, prepare the cake filling. Heat heavy cream in the microwave until just before boiling point. Pour into a bowl with chocolate chips and stir well until chocolate has melted and is smooth. Reserve close to a warm place so that the chocolate ganache won't harden. Rolling technique: Remove cake from the oven and place baking sheet on a counter lined with a clean kitchen linen or towel. Gently run a butter knife around the edges to loosen the cake from pan, making it easier to unmold. Next, spread a kitchen towel on top. Then place an empty and larger baking sheet pan on top of this, right side up, to sandwich the cake and towel between the two pans. Finally, flip the whole assemblage over in order to release the cake from the pan in which it was baked. Continue supporting/pushing the rolling edge of the cake with the towel beneath as needed until the cake layer is completely rolled. The cake rolls more easily while still warm. Reserve rolled cake layer covered with towel so won't dry. Bake the next cake and then so on. Each rolled cake is then rolled into the next subsequent sheet of cake that has been spread with the chocolate ganache. TIP: If any breaks appear in cake, press break with fingers to seal while it is still warm. Last, slice the 2 edges of the cake to remove rough, imperfect ends. If desired, either use the remaining chocolate ganache as a topping or sprinkle cake with granulated sugar. Garnish with halved strawberries (optional). Serve (chilled or at room temp) cake roll sliced into thin slices by itself, along with a cup of coffee. or slightly warmed and accompanied by a scoop of vanilla or coconut ice cream. STORAGE: You can store Brazilian chocolate cake roll in the refrigerator for about 1 week, or at room temperature for up to 3 days -- in either case it should be covered in parchment paper and then plastic wrap. Cake can be frozen for up to 1 month. Love chocolate cake? Try our Flourless Choco Nut Cake. OMG!!!!! this brings me memories! goes on my list of stuff to make… SOON!! Hehe… so good to hear that Sally! It’s very popular in my home state Pernambuco. Something that can’t be find often where I live now so I gotta make it for my family. I hope you enjoy it! Love the look of all the layers! I’ve heard of this but never had it. So thanks for the recipe so we can recreate it at home! So many layers of chocolate goodness! What a fabulous way to welcome the new season. Thank you Natalie! It is time consuming yet worth. So delicious! Yummy… This is a delicious recipe.. Perfect for not just chocolate lovers. Thank you so much! This is a treasured recipe from my home state in Brazil. Something that I love and really wanted to share with you all. Enjoy! Thanks for detailed recipe and tips. It is an impressive cake and I imagine a labor of love. I will try to make for V-day! A magnificent cake — and delicious too. Thanks for the recipe!